Help Your Child with Spelling Practice at Home: Use Look, Say, Cover, Write Spelling! For children and adults, understanding how to study is often the key to academic success. This is especially true when it comes to learning new vocabulary words or spelling practice. All too often, parents rely on only one method for helping children learn their spelling lists – the “spelling bee.” You know how a spelling bee works. The announcer says a word, and then the speller begins to slowly and methodically regurgitate the associated letters in their appropriate sequence. This method is fine for words that have already been memorized, but can prove to be rather difficult when learning to spell an unfamiliar word. Furthermore, it can seem quite monotonous. For students who are easily distracted, the spelling can easily become a jumbled mess if they lose their concentration or forget the beginning word all together! You can give your child an extra advantage by establishing good study habits right from the beginning. The “Look, Say, Cover, Write” spelling method is an easy and effective activity for initially learning new spelling words. First the child (or parent) copies the list of identified study words onto a piece of paper. Next, s/he is encouraged to “Look” at the word. What you are really asking, however, is that they study the word. S/He should take the time to say the word out loud, look at the whole word, say the letters aloud and look for identifiable patterns or shorter words inside the bigger word. They are looking for anything that will help commit the word to permanent memory. Using the word in a sentence might also be helpful at this stage. Before moving on to the next step encourage your child to close his or her eyes, try spelling the word from memory, and then opening their eyes to check accuracy. Looking at the word one last time before attempting to spell it on their own can be of help. Now comes the time to “Cover” the word. Your child can use a hand, a bookmark, or another piece of paper. They could even simply fold the paper over itself so that the spelling is hidden from sight. During this time, the speller should try to imagine the word. S/He should try to remember what it looked like, what spelling pattern was used, or what smaller words were hiding inside the bigger word. For this step, some students find that again closing their eyes is quite helpful…even if the word is covered up by something else! The “Spell” step is self-explanatory. Below you will find a form which can be used. It shows all of the above steps, and provides a place for the child to write the word down – although a piece of scratch paper can also be used. The final step is to check the accuracy of what they have written. This is done by comparing it letter by letter to the correct spelling. I often required my students to use both hands as they simultaneously pointed to each of the letters in a word. This way, they were certain to catch any mistakes. If there are mistakes, the process should be repeated from the beginning until the word is spelled correctly. 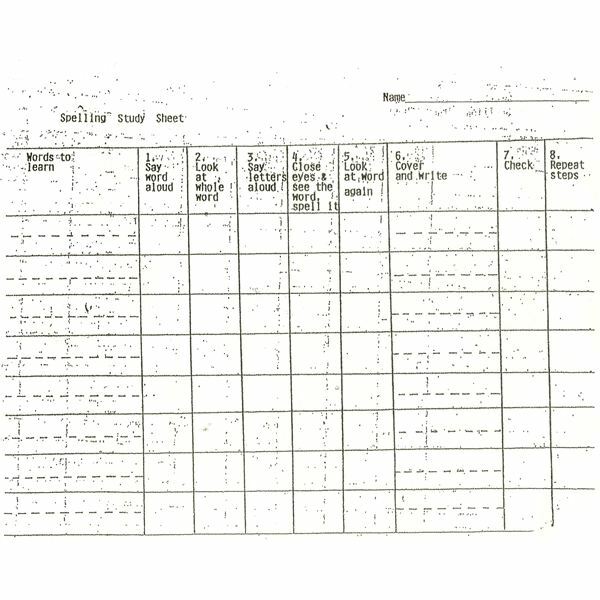 A sheet of regular computer paper divided into 3 horizontal columns may be used in lieu of the form shown above. Simply write the designated words in the first column, allow room to attempt the spelling in the second column, and provide a place for additional spelling practice in the third column. The “Look, Say, Cover, Write” spelling method is also a great way to study vocabulary words, addition/subtraction/multiplication facts, historical dates with related figures and key events, or even the Periodic Table. It’s applications beyond spelling practice are only as limited as your imagination! Do you have spelling games and activities which you find to be effective? If so, be sure to visit the comments section below. The advice and information offered in the article are based on the author's experience as a classroom teacher and homeschooling parent. Whether it’s learning word lists or simply developing skills, this series of articles will provide you with a variety of activities that you can do at home with your children to help them practice their spelling!